Nesha here! I'm so excited that I finally get to share this blog post with you guys because it's soooooo good! Krista Rae, a strategic Wordpress developer, is here today to show you how to offer web design services when you don't know how to code. When I decided I wanted to be a freelance designer, I knew a bit about HTML and CSS, but not enough to start offering web design services. The thought of screwing up someone's website because I couldn't code properly put me off from actually offering web design for a long time. But there are things you can do if you don't know how to code and still want to design websites for a living. Read on to hear Krista's awesome tips! Web design is a great complement to a branding or graphic design business. With that combination, you can find the perfect clients and keep them, rather than offering branding and then referring them elsewhere for a website. Luckily, if web design is something you’re looking to add to your business there are several options for how you can do it, both with and without coding on your end. In this post, we’ll cover 3 of the best options for doing just that, the pros and cons of each option, and the details of the option that will give you the most freedom. Let’s dive in! Holly Meyer is the talented brand and web designer behind Holly Meyer Design. She enrolled in my course, Organize & Automate, this Summer and saw SUCH great results from it that I knew I had to turn her experience into a full blog post for you to see. Real quick before we dive in: Organize & Automate is my signature video course, made to help web + graphic designers streamline their design process so they can work smarter and faster, not harder. Work smarter so she can take on more clients without more stress! Sometimes, designers, artists and makers like to create freely and not follow a system. If you're painting something for your bedroom wall then sure, go ahead. Don't stick to a process, just go with the flow! But if you're running a business and working with clients, you need a process. Clients become confused because they don't know what's coming up next or what their designer needs from them. The projects goes on much longer than the designer anticipated. The client gets frustrated with the designer. The designer becomes frustrated with his/her work and kiiiiinda wishes they were back at their day job. The client never works with the designer again because the whole process was exhausting and unorganized. OK, so I didn't hate Squarespace... That's a little dramatic of me. But I didn't understand the hype around it, or why why dozens of my friends were switching from Wordpress to Squarespace. However, a conversation with a friend totally changed my opinion of Squarespace. As we sat drinking frappucinos one afternoon, we began talking about work. I told her everything was going well and I was still enjoying my business. But I wished things were a little more simple. I explained that one of my goals this year is to achieve a simple business. I thrive most when things are simple, easy and clean. I've noticed this spans into my personal life too, not just my business. I like simple interior decor, simple outfits, and I much prefer a simple and quiet life over a busy city life. I've slowly realized that when my business systems and strategies are simple, I feel happier and more relaxed. And my business blooms a lot more when I feel that way! I told my friend that I'd simplified a lot of my systems, but things still didn't feel 'easy' enough. I'm a big believer that business should be easy, or else it isn't fun. "You wrote a blog post on Wordpress vs. Squarespace, right?" "I know Wordpress is awesome and offers everything you could ever need in a website, and I know that you love it. But maybe what you need is a simpler platform, with less updates and plugins and themes. Like Squarespace." She'd been raving about Squarespace all year and I'd just rolled my eyes. But it was when she said that (or something to that effect, anyway) that I decided to give Squarespace one last try. I signed up for another trial of Squarespace and set myself a little excercise: see how long it takes to rebuild my website on Squarespace, getting as close as I could to my Wordpress design. And here's the amazing thing: it took just two days, and that was in between doing client work. Here the other amazing thing: I think my Squarespace sites looks better than my Wordpress site. It's amazing how much better my second Squarespace trial was. Maybe it's because I actually gave myself an assignment instead of fiddling with a theme I wasn't interested in. Either way, I've found myself jumping on the Squarespace bandwagon. Not because it's better than Wordpress but because it has something Wordpress doesn't: severe simplicity. Anyone could learn Squarespace in a day, and that really appeals to me. I knew my clients would love it. I design brands and websites for small business owners, and they usually like to maintain and update their website themselves when our project is over. Squarespace is the perfect platform for them to maintain their site easily without getting confused or stressed out. I love the drag and drop feature. I barely have to touch any code! I love that it's limited, which is ironic because that's one of the aspects I disliked to begin with. But I love that my clients and I can only choose from a certain amount of themes. It stops us from overthinking things. I'm very happy with my decision to switch from Wordpress to Squarespace. In fact, I'm thinking of creating a mini-series on it for you very soon! In case anyone is wondering, I'm using the Galapagos theme. It's a very popular theme for bloggers because of how simple and clean it is, so I highly recommend you try it if you're a Squarespace user! I'd love to know- are you thinking about switching to Squarespace? Do you have any questions or concerns? 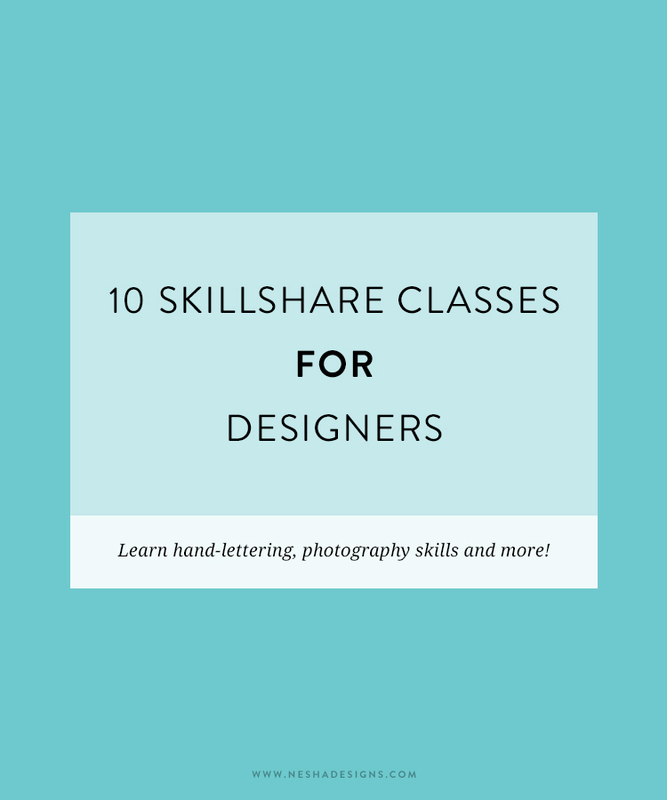 Leave me a comment letting us all know your favorite Skillshare classes, or tweet this post to share it with your friends! Next week I have another roundup of amazing Skillshare classes for bloggers to take, so I hope you'll stick around!